Mitochondrial decay resulting from oxidative damage accumulates with age and is universally recognized as a major contributing factor to the whole range of functional decline and tissue deterioration associated with aging.1 2 3 4 5 6 7 Part I of this review discussed Bruce Ames’ application of the Michaelis constant (KM) concept to the ramifications of age-associated oxidative damage to proteins. Aging-associated increases in oxidative damage to key enzymes results in their structural deformation and decreased binding affinity for the co-enzyme, causing a decrease in enzyme funtion.8 Ames’ research has demonstrated that increasing the availability of acetyl L-carnitine and α-lipoic acid, two nutrients that serve as mitochondrial enzyme co-factors, restores the velocity of the reactions (KM) in the related enzymes, and thus restores aging mitochondria’s ability to produce youthful levels of ATP.9 10 11 12 13 Part II focused on the inter-relationships among the folate, methylation and transsulfuration pathways, whose dysfunction results in increased free radical production coupled with disruption of glutathione (GSH) synthesis, thus accelerating mitochondrial decay and aging. Ensuring adequacy of all the nutrient co-factors necessary to restore KM in these pathways, as well as in mitochondrial oxidative phosphorylation, is first line therapy for promoting healthy aging. However, a protocol whose end goal is restoration of KM, while certainly helpful in delaying mitochondrial decay, does not address the more fundamental issue – why does human physiology shift from a homeostasic state that repairs and balances itself to one that allows decay to accumulate? Researcher Wulf Dröge has called this shift “the first cause of death,” and his insight into its likely causes may both explain why calorie restriction increases longevity and provide a much less onerous way to opt out of the vicious cycle responsible for the age-associated transition from a state of youthful homeostatic repair to one that promotes mitochondrial decay. This is the topic of Part III of this review. Aging occurs because the complex biological molecules of which we are all composed become dysfunctional over time as the energy necessary to keep them structurally sound diminishes, thus our molecules must be repaired or replaced frequently by our own extensive repair systems. These repair systems, which are also composed of complex molecules, eventually suffer the same molecular dysfunction. The time when the balance shifts in favor of the accumulation of dysfunctional molecules is determined by natural selection — and leads to the manifestation of age changes that we recognize are characteristic of an old person or animal. It must occur after both reach reproductive maturity, otherwise the species would vanish. These fundamental molecular dysfunctional events lead to an increase in vulnerability to age-associated disease therefore, the study, and even the resolution of age-associated diseases, will tell us little about the fundamental processes of aging. In humans, the signaling mechanism that slows autophagic recycling is identical to the signaling mechanisms that control our response to insulin and insulin-like growth factor, thus it can also be called the insulin mechanism. Bottomline: aberrant insulin signaling that inhibits autophagy, particularly mitophagy, is the first cause of death. In addition to its role in clearing glucose from the bloodstream, insulin stimulates protein synthesis in skeletal muscle and other tissues (provided sufficient amounts of free amino acids are available). Thus, most protein synthesis takes place during the day when food consumption raises blood levels of amino acids and insulin. Through the same signaling mechanism, the increase in amino acid and insulin concentrations triggers suppression of autophagic activity in the fed state, i.e., for most of the day. 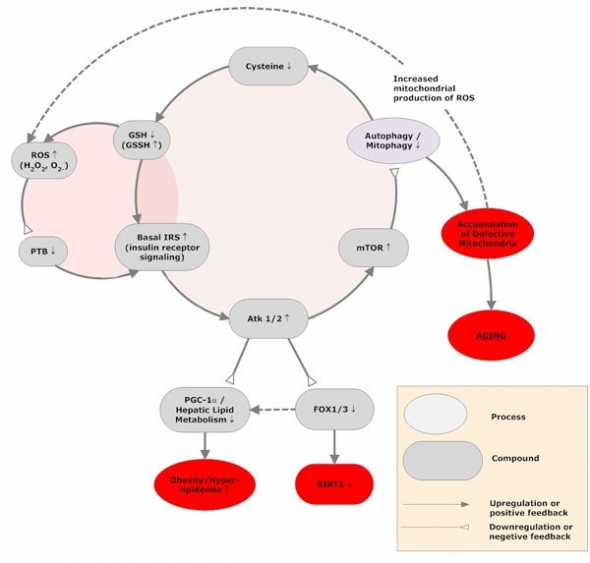 Autophagic waste recycling happens mainly in the fasted state—in man, mainly at night—when amino acid and insulin concentrations in the blood drop off, protein synthesis largely shuts down, and autophagy is allowed to proceed. In young individuals, the resulting nightly autophagic protein breakdown is normally so strong that it causes skeletal muscle tissues to release substantial amounts of free amino acids, including the cysteine needed for glutathione synthesis and defense against oxidative stress. In the fed state during the daytime, glutathione biosynthesis is maintained by cysteine from dietary protein. Excessive autophagic destruction is avoided at night through a feedback mechanism that halts autophagic clearance when its products, free amino acids, reach a sufficient concentration. Autophagy converts proteins from damaged mitochondria and other forms of cellular waste into free amino acids. The resulting increase in free amino acid concentrations activates the serine/threonine kinases, Akt1 and Akt2, which mobilize the signaling protein mTOR (the mammalian target of rapamycin), which then suppresses autophagic activity. The same mechanism operates during the day when dietary protein and carbohydrate are consumed; the resulting increase in plasma amino acid and insulin concentrations results in activation of mTOR, which stimulates protein synthesis while suppressing autophagic activity. Activation of the insulin receptor involves its autophosphorylation, which is followed by phosphorylation of several target proteins in the signaling cascade. The insulin signaling cascade is inhibited by several phosphatases, including protein tyrosine phosphatase 1B (PTB 1B), phosphatase, tensin homologue on chromosome 10 (PTEN), and SH2-domain-containing inositol phosphatase (SHIP2), all of which are inactivated under moderately oxidative conditions. Thus the age-related increase in oxidative stress sets up a vicious cycle in which the mechanisms that maintain adequate levels of cysteine in the fasted state are overcome, leaving older adults (and specifically, aging mitochondria) increasingly susceptible to oxidative damage and less able to remove damaged cellular components via autophagy. Aberrant insulin signaling drains glutathione reserves. PTP 1B, a key redox-sensitive signaling phosphatase in the insulin receptor signaling pathway, is inhibited by hydrogen peroxide (H2O2), which converts PTB 1B’s catalytically necessary cysteine moiety into cysteine sulfenic acid (Cys-SOH), which then interacts spontaneously with glutathione to form glutathione disulfide (GSSH), the inactive form of glutathione. GSSH can also convert PTP 1B’s redox-sensitive cysteine residue into the inactive disulfide. Changes in the thiol/disulfide redox status (discussed in Part II of this review in relation to the connections among homocysteine, methylation and transsulfuration) can also significantly inhibit the activity of the redox-sensitive phosphatases that regulate insulin signaling. In addition to causing the functional inactivation of these phosphatases, low concentrations of H2O2 or an oxidative shift in the GSH:GSSH redox status strongly increases the activity of the basic insulin receptor tyrosine kinase in the absence of insulin. Since the activity of the insulin receptor signaling pathway is determined by a balance between kinase and phosphatase activities, oxidative activation of the kinase combined with the simultaneous inactivation of phosphatases synergistically upregulates the insulin signaling pathway. The end result is an age-associated decrease in autophagy and the body’s ability to maintain adequate post-absorptive (night time or fasting) cysteine levels. The resulting drop in glutathione production and intracellular glutathione concentrations compromises the mitochondria’s ability to scavenge reactive oxygen species (ROS), producing a vicious cycle that drives the progressive increase in ROS-mediated structural damage and its corollary, the progressive decline in energy production and repair that accompanies aging. In young healthy individuals, the role played by oxygen radicals and H2O2 in enhancing insulin signaling is helpful, and so important that almost all cells and tissues contain special enzymes that produce H2O2, and O2- at a well-regulated rate. But in older individuals in whom basal levels of oxidative stress are already increased, aberrant insulin signaling during the fasting state that militates against mitophagy and further decreases glutathione stores, becomes the final straw. A vicious cycle is initiated. Lessened mitophagy results in a decrease in plasma cysteine concentrations, which causes a decrease in intracellular glutathione, which causes a corresponding increase in H2O2 and O2-, which leads to further insulin-independent upregulation of the basic insulin signaling mechanism, which further represses mitophagy, continuing the cycle. The insulin receptor signaling cascade is inhibited by several phosphatases, including protein tyrosine phosphatase 1B (PTB 1B), phosphatase and tensin homolog on chromosome 10 (PTEN) and SH2-domain-containing inositol phosphatase (SHIP2), all of which are inactivated by ROS. In addition, activity of the basic insulin receptor tyrosine kinase is strongly increased by low concentrations of H2O2 or by an oxidative shift in the GSH redox status. In the presence of H2O2 and ATP, the insulin receptor kinase domain is phosphorylated at its catalytic site and thereby rendered catalytically active in the absence of insulin. The phosphatases, in turn, contain a redox-sensitive cysteine moiety in their catalytic site, which is converted by H2O2 into a sulfenic acid moiety, which renders the phosphatase inactive. The balance between kinase and phosphatase activities determines the rate of phosphorylation of the insulin receptor kinase domain and several downstream targets including the phosphatidylinositol phosphates, the serine/ threonine kinase Akt1 and the mTOR. Ultimately, this balance controls the aging-related functions of autophagy and sirtuin proteins. The insulin-independent oxidative upregulation of insulin receptor signaling activity (basic IRS) results in inhibition of autophagic removal of damaged cell structures (Autophagy) and ability to maintain post-absorptive plasma cysteine concentrations. This causes a decrease in intracellular glutathione (GSH) and a corresponding increase in ROS (H2O2, O2-) concentrations that further upregulates the insulin-independent insulin receptor signaling, perpetuating the cycle. These changes occur in primarily during the night and early morning hours, i.e., in the post-absorptive/fasting condition. In the postprandial (fed) state, the insulin receptor plays a positive role as a key regulator of glucose clearance, protein synthesis, etc. Its negative effects are related to aberrant (insulin-independent) insulin signaling in the post-absorptive (fasting) condition. Mitochondria are widely believed to play the pivotal role in aging because they are a major source of oxygen radicals and arguably their most important targets. Thus stressed mitochondria are a preferred target for autophagy. However, it is a common finding in old age that structurally abnormal mitochondria accumulate in post mitotic cells, mitochondrial oxidative phosphorylation decreases, and mitochondrial H2O2 production increases—the latter indicating that at least some of the abnormal mitochondria have defective electron transport chains and produce abnormally high amounts of O2-, H2O2, and other ROS. This happens because mitochondrial DNA is particularly vulnerable to oxidative damage and shows a more than ten-fold greater mutation rate than nuclear DNA. O2- and other ROS induce mitochondrial DNA deletion mutants, which have been hypothesized to out replicate the wild-type (normal) mitochondrial DNA genome.32 The DNA of these mutated mitochondria may then code for abnormal electron transport chain complex enzymes, resulting in increased electron loss, increased production of H2O2 and O2-, and the initiation of the vicious cycle of progressively increasing oxidative stress coupled with progressively decreasing autophagic recycling. ROS may also cause lipofuscin deposits that further compromise autophagic removal of defective mitochondria. The goal is NAC supplementation sufficient to increase glutathione levels, prevent aberrant insulin signaling, and restore night-time mitophagic activity and amino acid homeostasis to a youthful level. Since glutathione and cysteine concentrations are relatively low in the post-absorptive state, especially in older individuals, NAC is best taken early in the morning and before retiring for the night — several hours after consumption of the evening meal to ensure a postabsorptive state (i.e., that normal insulin signaling in response to food intake is not occurring). Autophagy, the body’s mechanism for the removal and recycling of cellular waste, is key to rejuvenation, especially in the mitochondria, and is allowed to proceed only in the postabsorptive state, in which insulin signaling ebbs to its lowest (basal) level. 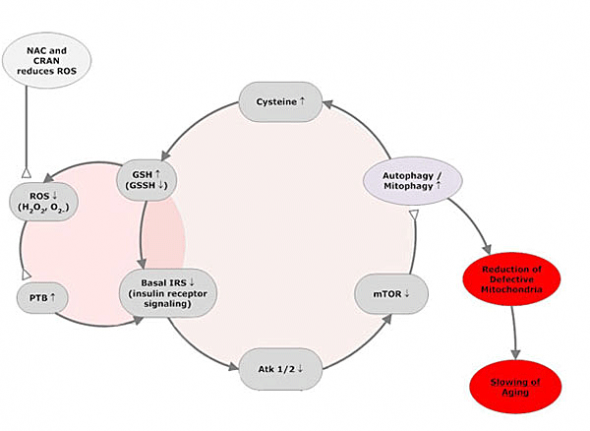 With age, ROS-induced aberrant triggering of the insulin signaling mechanism in the postabsorptive state inhibits autophagy, preventing maintenance of plasma cysteine and intracellular glutathione levels throughout the night and early morning hours, and initiating a vicious cycle of progressively increasing oxidative stress and mitochondrial dysfunction. Since accumulation of cellular waste, decreased cellular glutathione concentrations and increased oxidative stress are common hallmarks of aging in a broad range of species, while lowered insulin signaling that promotes autophagy, whether resulting from genetic mutation or caloric restriction (with adequate nutrition), has been shown to extend lifespan in virtually all species tested to date, it seems likely that human life- and health-span may be extended by a protocol designed to re-establish youthful levels of mitophagy and postabsorptive cysteine concentrations, such as the one proposed by Dröge and outlined in this article.